Locations: Sand Patch, Cranberry Grade, Griffith, Chicago, Grafton, Cumberland…more. This is the latest release from Charles Smiley Presents. A CSX Heritage Story. Mainly known for Western States train video productions, Charles Smiley has ventured eastward, to a fascinating area, of the old Baltimore and Ohio. The film lineup, is lean and mean, with only 3 film sources listed for a CSP program. Three matches the tri-color Chessie System scheme, and it appears that 3 is to be, our lucky number! This program starts with train action. It is readily apparent that a fascinating assortment of CSX heritage locomotives are to be witnessed. This was a colorful time for railfans. We get the history of the B&O, C&O, WM and circumstances ,that proceeded the Chessie System. This background is interesting, and the history lays the foundation, for what followed. 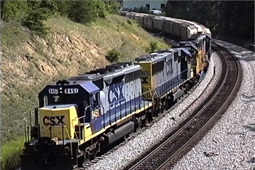 Chessie System and Seaboard System merger to form CSX. Valleys frequently have the right of way and town structures in close proximity. Detailed maps are the best yet. Frequent reference to the maps are very handy to keep the viewer apprised of location as we progress along the different trackage routes. I like the pairs of geographical and topographical maps. 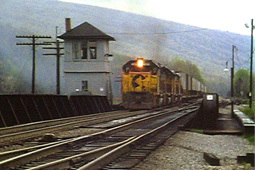 The train locations and direction and even some car counts are noted with on-screen graphics. The map showing both; B&O and C&O lines and where Pere Marquette added to the C&O operation was a major help. The action is nonstop! We have; 1983, 1989 and 1991 that looks pro shot. Flashbacks to 1969 look excellent. Live natural sound, is outstanding. The wheels squeal on the curves, the familiar EMD chant, the horns are at times.. realistically loud. Other portions, have music and some scenes, mix both. The Allegheny Mountains are beautiful in all seasons. Viewpoints are dynamic and ever-changing. It’s fun to watch a half a dozen locomotives, smoking their way uphill, grinding it out, in Run 8! Dynamic brakes whine with the downhill freights. Many shots are in no rush to leave, and good views of the freight cars are seen. There are helper sets too. Not all the views are all, in the clear. Trains snake their way through old towns, or some bare branched trees in a snowy mountain landscape. Seaboard Coast Line as CSX 6360 has the CSX SD50 helpers uncoupled and is continuing on it’s move. We traverse between the years, as well as the: weather, scenery and trackage.
. CSX has some different paint schemes, including, yellow nose, gray ghost, blue and gray plus Operation Redblock. The Racetrack CSX is my personal favorite, and Charles Smiley’s crew too. Some others that appear are L&N, C&EI, RF&P, and Conrail. 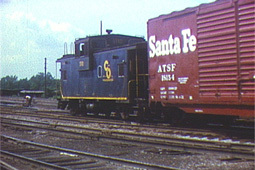 The 1969 footage shows solid C&O and B&O trains. The L&N trains are a nice extra. 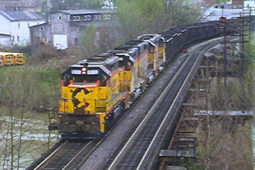 Locomotives are largely Electromotive Division aka EMD. Four axle units predominate. 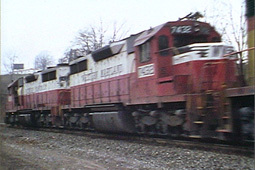 GP40-2, GP38-2, GP30, GP35, GP9 and GP9 torpedo tube geep. Big six axle locomotives SD40-2, SD50, SD7. Also; GE C30-7, and converted EMD CSX road slugs. The 1991 portions have some 3rd generation power. Older units are buried in the long lashups that work Sand Patch. This is from 1983 film. The trains themselves are: General merchandise, coal trains, TOFC, auto racks and grain trains. Cabooses are on some trains. I was glad to find some from the Chessie safety series. The narration is different then some other CSP releases. The narrator backs away for much of the second half, letting the action take center stage. The live sounds dominate, with the narration kept to a minimal, as needed basis, The on-screen graphics effectively communicate some information as : location, car count, eastbound or westbound. I found this very enjoyable. While all the Charles Smiley Presents series are of a very high standard, this one contains a more fun atmosphere. A subtle difference, but a nice change for just being able to be at the locations and just… trainwatch. Personally, Chessie System and predecessors B&O and C&O have always been some of my top railroads. Vintage film from 1969, adds some extra class. This production, blows away any previous Chessie films. 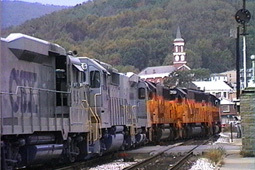 The abundance of the attractive 3 color scheme, is a major advantage over later CSX entrenched films. Mountain Grades of the B&O, gets the highest recommendation. Chessie fans need this one. So run, don’t walk to your local hobby shop. This one will be difficult for your dealer to keep on the shelf…. and your own. 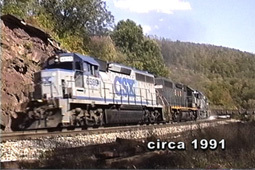 This entry was posted in ATVR Reviews, Charles Smiley Presents and tagged American Train Video Reviews, B&O, C&O, Chessie System, Chicago railroad, new releases, Railroad, Train DVD, train video reviews, transportation by William J. Hudson. Bookmark the permalink.